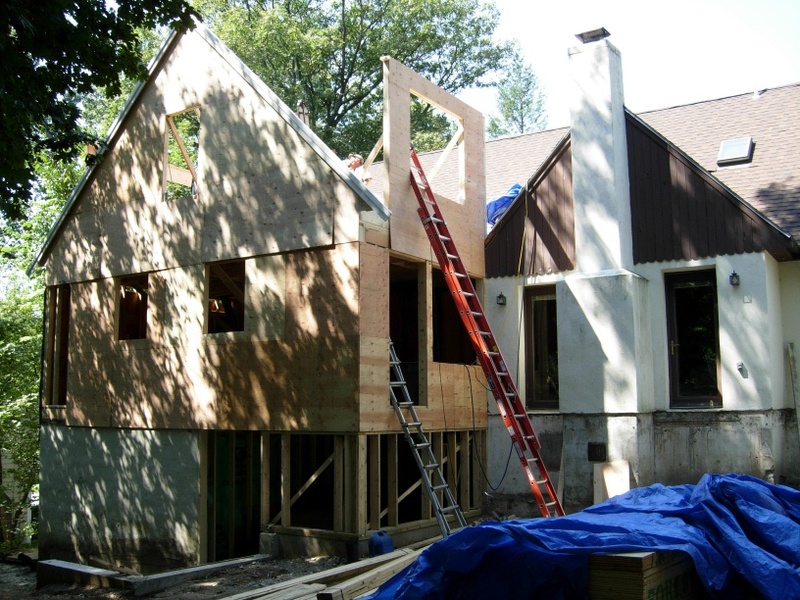 Cambridge architect Thomas Downer has several new projects including a home addition in Winchester MA; sees home renovation making a comeback. The addition that Cambridge architect Thomas Downer designed is going up quickly. Cambridge architect Thomas Downer is happy to hear that the prices of houses are on the rise. He knows this means people will be more confident in investing money into home improvements which should translate into new opportunities for him to continue designing home remodels, renovations, and additions for families in his community. He is currently working with Tom Angeli of ATA Building & Remodeling to design and build a home renovationand addition for a young family in Winchester, MA. “Home renovation activity has really blossomed since the beginning of the year. Many of the architects I know through the Boston Society of Architects are flat out, and remodeling contractors are getting busier too.” said Thomas Downer. Thomas Downer is the owner/principal of Downer/Associates, a residential architecture firm in Cambridge, MA that provides high quality and sustainable designs that are focused on the clients’ needs and budget. His firm specializes in home renovations, remodels, and additions that seamlessly enhance the original design of the house. They also offer design/build services that provide single source responsibility for design and construction in order to expedite the project schedule and provide greater cost certainty. In working with ATA, Tom’s clients wanted a more spacious home that included a renovated kitchen, master suite, and extra bedroom, plus better circulation in the living areas. To achieve this goal the design, still under construction, will gut and expand the existing kitchen by nine feet, and provide 550 square feet of additional space for the Master Suite in a 2nd floor addition at the rear of the home. The new kitchen design and the expanded dining room create improved circulation between all the living areas. The new kitchen will have both an island and a family dining table, and will feature semi-custom cabinetry, as well as granite counters and hardwood flooring. The master bath will include a large granite top vanity with two under-mount sinks. The toilet, bidet, and large acrylic shower will be in a separate room, and ceramic tile will be laid throughout the entire bathroom. The project is well under way with the demolition finished and the addition framing nearing completion. This project should be wrapped up by late fall of this year. This press release was prepared by Bobrow Consulting Group (BCG) for Downer Associates. BCG works with building design professionals to build their business by optimizing their online strategy,teaching marketing for architectural firms as well as offering web design and SEO consulting services.